When I was a small boy in the 1950s, I remember my Grandfather Conrad saying that he knew of only a single other Hasselbacher in the USA. That person was in Red Cloud Nebraska. Later in my life I found out he was right. Johann Hasselbacher, the brother of my Grandfather's Grandfather immigrated to Nebraska in 1871. He founded a family that included the late Vernon Hasselbacher who was interested in family history. Alas, I have not yet found a single living member of that branch of the family to correspond with. 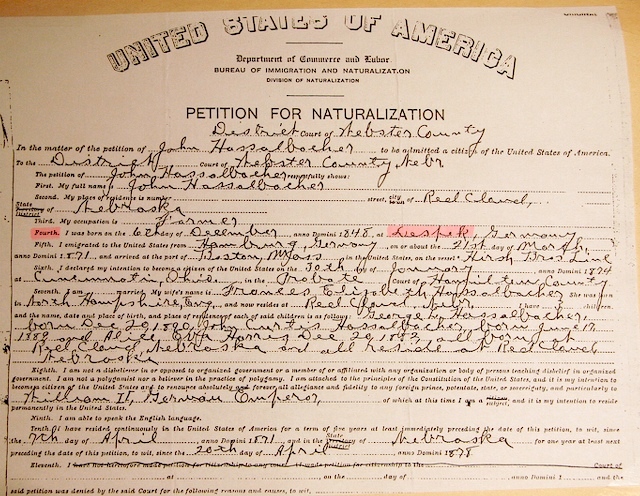 I have Johann Konrad's Naturalization Petition (below) and Birth Certificate. If anyone can steer one of the Nebraska descendants to me, I will be grateful. They are my cousins. I assume the spelling "Hassalbacher" is aberrant as 1880 census reports use Hasselbacher. (It is spelled in even other ways elsewhere in later years.) You all know how our name gets mangled by others. For interest I include on this page the church abstract of his birth certificate from Diespeck that I recovered. I suspect that he was not living in Cincinnatti when the application was filed but he did have a close relative there: Andreas Friedrich Hasselbacher b May 25 1830 who immigrated to Cincinnati in 1872. One can only wonder if John ever visited his first cousin once removed. Their common ancestors are my 5G Grandparents. I recall seeing an account of his early years in the USA including how he met his wife. Any additional information would be welcome. Johann's birth certificate is available elsewhere on this site and is a good example of the kinds of materials I have to work with.